International Islamic University Islamabad (IIUI) Wednesday held a flag hoisting ceremony at Faisal Masjid campus of the university and a book exhibition in connection with 70th Independence Day celebrations, where Ambassador of Kingdom of Saudi Arabia (KSA) Nawaf bin Said Al-Malki hoisted the Pakistani flag. IIU Rector Dr. Masoom Yasinzai and President IIUI Dr. Ahmed Yousif Al Draiweesh, university Vice President, DGs, Deans, Directors and faculty members were also present on the ceremony. Pakistan is proud of Muslim Ummah which emerged with an objective of Islam. Said Ambassador Malki. He said that Pakistan and Saudi Arabia have an immortal friendship and bilateral ties between the brethren countries are heart to heart. He maintained that unity and prosperity of Pakistan was unity and prosperity of Muslim world. He furthered that KSA was proud of its cordial relations with Pakistan. Rector IIUI said on the occasion that Pak-Saudi ties were deeper than the oceans and higher than skies. He added that IIUI was an example of exemplary ties between both the friendly states, while he reiterated his resolve that the university would come up to the expectations of Muslim world by bringing top minds in main stream and by nurturing them in lights of Islamic teachings. He stressed upon the educational institutions that youth should not be disappointed rather they should be told that they are hope of the Muslim world. 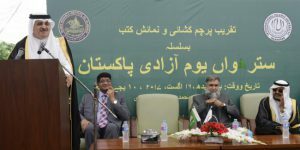 Dr. Ahmed Draiweesh, IIUI President said that Pakistan came into existence due to prudent thoughts and untiring efforts of Qaid e Azam Muhammad Ali Jinnah and great thinker Allama Muhammad Iqbal. 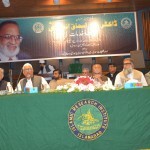 President IIUI urged for Muslim unity and said that it was a need of hour. He said that Islam s enemies want to destabilize Muslim Ummah while there lethal aims can be foiled by remaining united. 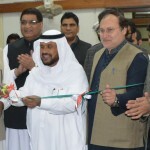 Later, a book exhibition at Hamid ullah Library of the university was inaugurated by KSA ambassador Nawaf bin Said Al-Malki where books written on Pakistan Movement were brought on stalls which took special response from the visitors. On this occasion an Independence celebrations cake was also cut by the Ambassador. In his remarks, Director of the event s organizer institute (IRI) Dr. Muhammad Zia ul Haq paid rich tribute to the leaders and people who sacrificed their lives for emergence of the homeland.